One hundred and seventy-five years ago, Charles Darwin set out with a survey voyage, aboard the HMS Beagle, in what would be a groundbreaking expedition for his own theories, and the way the world would come to see the origin of species. Intrigued by the vast differences in the closely-related mockingbirds and finches on the Galapagos, Darwin brought this curiosity home to England, and found a way to test his thoughts on speciation, using an animal equally admired and despised: the pigeon. Specifically, “fancy pigeons,” the odd, often comical, sometimes scary-looking breeds of pigeon, whose popularity and availability was burgeoning just as Darwin needed specimens. 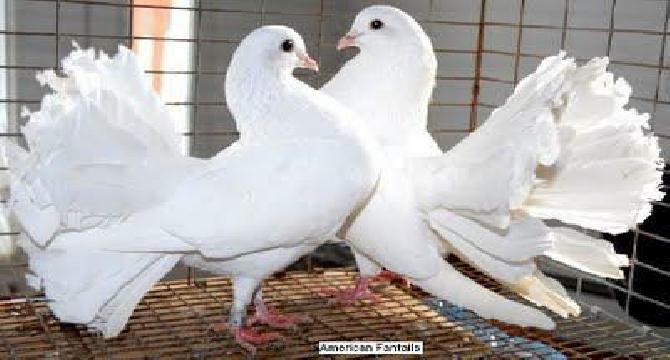 By crossbreeding the many species of fancy pigeon, he showed that contrary to the commonly-held belief that there were two different species which led to the diverse lot of the domestic pigeons, they all arose from just one wild species: the Rock Dove (Columba livia). Though he professed to never developing a true fondness for the creatures, his fascination with them and interest in their origins allowed him to show himself that the theories he was developing were, in fact, probable, and he was not mistaking coincidence for causation. Long before Darwin, the rock doves of Mesopotamia and Sumer flocked to the fertile fields, pecking at seeds, and were soon encouraged to roost in nest-houses in cities and on farms. Their squabs (fat, nearly-grown nestlings) provided rich sources of protein, in a land where wild game had grown scarce. While domesticated red junglefowl (now our common chickens) were the poultry of choice in India and much of Asia, pigeons (rock doves) were the predominant meat bird and religious sacrifice in the Middle East and Europe for millennia. Soon after their domestication, pigeons became far more than just sources of meat. People watched them and realized that their behavior mimicked that which we held in highest esteem in humans: they’re monogamous, each of a pair serving and caring for the other and their offspring; they have a strong homing instinct, and fierce protection instinct in the nest; yet they’re largely peaceful creatures, highly intelligent but living what humans saw as a simple and ideal life. Humanity exploited these traits in breeding successful messenger pigeons as far back as ancient Phoenicia. In many lands, we deified and exalted the species. Noah released a dove from his ark, which returned to him. The goddesses Ishtar, Venus, and Aphrodite are all represented by doves. In Christian iconography, the dove is said to represent the Holy Spirit, and in China, doves were said to represent fidelity and longevity. Doves even found their way into the questionable “cures” of old, supposedly warding off the plague and palsies. The ubiquitous pigeons that populate our cities and towns are all descendants of escaped domesticated pigeons, and cross-breeding with the wild rock doves in their native European habitats has led to a near-extinction of the pure-type Columba livia. In the Americas, however, no such cross-breeding has occurred. Why? Well, our only native pigeon was the Passenger Pigeon, and they’ve been extinct for over a hundred years. Yep, all of our American pigeons are “imports,” just like dandelions. Wildly successful, adaptable, and reproducing faster than we can control, feral pigeons spread to every corner of the inhabited world, outside of Antarctica. But even as the escaped or released pigeons overtook our cities, the ones who stayed captive proved their usefulness. In wartime, messenger pigeons have been used successfully for thousands of years, back to the battles of the Greek city-states. More recently, WWI saw heavy action with these fast-flying “thoroughbreds of the sky.” The pigeons could deliver messages faster and more effectively (with a 95 percent arrival rate) than any human messenger, and one pigeon, named Cher Ami, even delivered a message after it lost a leg and got a bullet fragment lodged in its chest, saving 500 Allied soldiers. As recently as the War of Independence in Palestine/Israel, the Israeli forces successfully used pigeons to deliver messages when all other means of communication were cut off. well huge post a big history about pigeons. Your post is fabulous but very hard to read it full its huge.